Maco PKG, a trusted name in the packaging and manufacturing industry, provides a wide range of flexible packaging options, including the most preferred stand-up pouch. We manufacture stand-up pouches, both with and without zippers, using materials such as foil, polythene, and paper. We stock these pouches in varying sizes and designs, both plain and printed, for supplying the broadest collection to our customers. 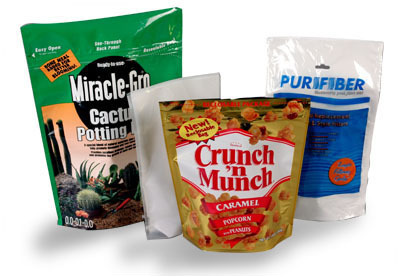 Maco PKG’s stand-up pouches are highly regarded among name brand companies. Versatile and practical, they are easily recognized in the market. They function well on in-store shelves, both as an advertisement and as a protective package. Their great shelf presence makes them a favorite choice for packing a wide range of products. It is highly recommended for industrial products since they increase efficiency and minimize waste. To take advantage of the time your product spends on the store shelf, our wide range of stand-up pouches offers protection against moisture, gases and light. The appearance of packages plays an important role for successful marketing, so we design our stand-up zipper to serve as a valuable market tool. On top of that, they have efficient weight carrying capabilities and high quality raw materials with state-of-the-art technology to meet your individual demands.